This is a guaranteed PRIVATE Helicopter Tour: Enjoy a beautiful sunset tour of Oahu . We will initially fly out to Waikiki and Diamond Head before heading back towrds Pearl Harbor - watching the stunning sky change colour as sunset approaches. Heading further West we cross the Wai'anae Range and watch the sun setting into the Pacific Ocean. For the romantics and photographers <3 - This is one of the most spectacualr tours in O'ahu - and we are the only comapany offering this route. This is the perfect proposal tour. Why not take advantage of our "Will you Marry Me?" sign in the sand on one of our secret beaches? This is offered as both a doors on and DOORS OFF Tour! 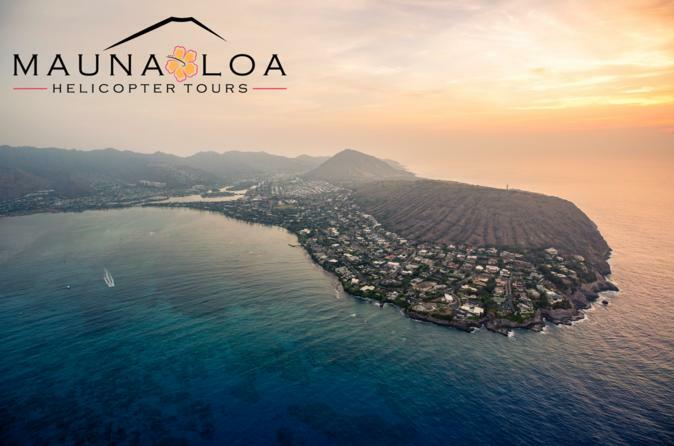 Our VIP Oahu Sunset is our most romantic helicopter tour of Oahu It is perfect for anniversaries, proposals or photographers who wish to bathe in the glory of Oahu and all it’s beauty. For the romantics, we offer our assistance in making your special moment more memorable. Customized music and narration is available upon request. This is your moment – let’s make it happen! Watch the sun set into the sparkling blue waters of the Pacific Ocean on the leeward side of Oahu. Gaze in wonder at the skyline’s beautiful hues of pink, orange and red. Your VIP Private Helicopter Tour will depart from Honolulu Airport, pass over Pearl Harbor and cross to the Western shoreline and the Waianae Mountain Range. You will witness the sun setting as we fly from Ma’ili and Makaha up to Ka’ena Point. The twilight skies will amaze you as the pink, red and golds fade, night falls, and the twinkling lights from above and below take center stage. And did we mention that moon?! This is the perfect proposal tour. Why not take advantage of our "Will you Marry Me?" sign in the sand on one of our secret beaches? Add champagne , flowers and your own special music. We will work with you to make this a truely unforgettable flight!